Here we are at the last Eye Candy Friday of 2016. It seems like I should show you something momentous, yes? 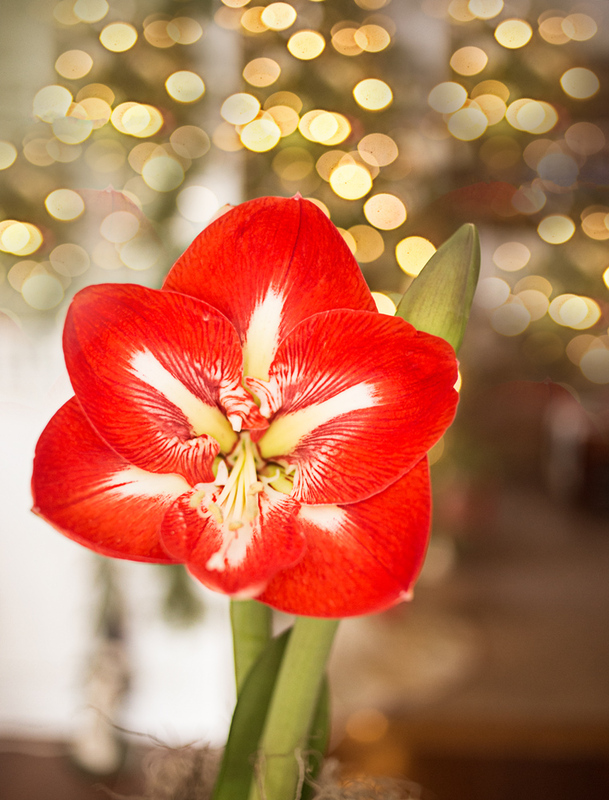 Well, I just so happen to have a truly fabulous amaryllis to share with you today. Momentous, for sure. Epic, even. This blossom fully opened on Wednesday and it’s the prettiest amaryllis I’ve ever had. It’s not super tall, which I really like, and the flower isn’t huge but it’s beautiful. There’s another blossom opened now plus two more to go on this stalk and another stalk that will bloom later, I hope. I’ve found a lot of joy watching this plant grow and I’ve also shared that joy with my fellow bloggers as they’ve posted about their own amaryllis plants throughout the season. And really, sharing is what this blogging community is all about. A lot of the time we share joy and we celebrate together but sometimes we share sadness and difficult situations, too. As this year draws to a close I can’t help but feel grateful for all of the moments we’ve shared together, the times you’ve laughed and cried along with me, the times you’ve celebrated my victories and cheered me on when I’ve stumbled, all of it really being about the joy I get from sharing my life with you here. Happy New Year to all! And here’s to a peaceful 2017. Carole, the support that I have received through this blogging community has lifted me up and helped me through dark times, beyond measure. The last time I had difficult times, I stopped blogging altogether for a couple of years, and I’m really glad that I didn’t retreat this time – it was a beautiful lesson learned. Thank you so much for bringing a wonderful group of bloggers together. I’m looking forward to a wonderful 2017 with all of you. You said it so well, Carole – thank you! and that bloom is gorgeous! (you made me think for a bit about moving my blooms to the living room so I could get a bit of Christmas tree bokeh behind them 😉 true inspiration as always!!) Happy New Year! Arrh–the first word should be ” Having”. Absolutely gorgeous! Flowers, sharing, support, joy, and community are always welcome; thank you for your part in providing those! Beautiful close to 2016, the year that could use all the help it can get. You are usually the first blog I read in my early morning routine, and you get my day off to a good start. Here’s to more of what is good in 2017, and finding a way to manage what is not as we would choose. Happy New Year! Here-here am hoping 2017 is the year to beat all years- and the amaryllis is very lovely too. I miss being a part of this amazing community, a community that has changed so much through the years. You have kept people together, built the community into a strong, close group of friends and I thank you for keeping the party going! Happy New Year, dear friend!